In honor of the 40th Anniversary of Earth Day, these influential musicians along with political, environmental, religious and civil-rights leaders will join with a massive audience of concerned citizens to call on Congress to take action to address climate change in 2010. The day of speeches, live music and eco-village exhibits on The National Mall caps off nine days of service projects, advocacy events, performance arts and exhibits organized by Earth Day Network from April 17to 25. For additional information on The Climate Rally and a daily break-down of events, visit http://www.earthday.org/. "Forty years after the first Earth Day, we are joined by some of today's most influential artists and thought-leaders around the world with a clear agenda for Earth Day's 40th Anniversary," said Kathleen Rogers, President, Earth Day Network. "Together, we will issue the call to our elected leaders to take action that will equitably and effectively address climate change." The National Mall has been an American epicenter for change, as it was on the first Earth Day in 1970. Forty years ago, the National Mall served as a focal point for the first Earth Day and a 20 million citizens strong, country-wide, unified demand to protect and clean up the environment. This year, the U.S. flagship Earth Day events on the National Mall will once again act as a rallying point for the nation. Globally, Earth Day Network and its partners are orchestrating large-scale tree plantings, school greenings, music events and exhibitions in Washington, D.C.; New York City, NY; Rabat, Morocco; Kolkata, India; Buenos Aires, Argentina and Tokyo, Japan. Underwriters Laboratories is the U.S. premiere presenting sponsor of Earth Day 2010 and Future Friendly, Twentieth Century Fox Home Entertainment and Siemens are U.S. co-presenting sponsors. Earth Day Network campaign and programs are predicated on the belief that an educated, energized population will take action to secure a healthy future for itself and its children. The organization has a global reach with a network of more than 20,000 partners and organizations in 190 countries. 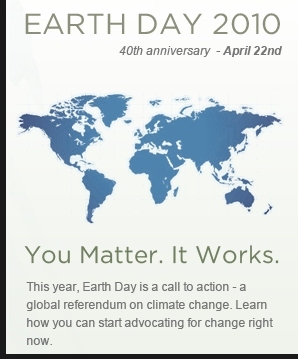 Earth Day Network is a 501(c)3 organization located in Washington, D.C.